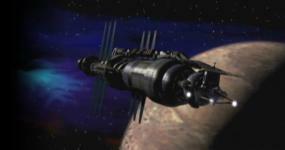 'The Nautilus Coil' described a new Psi Corps ship, the Cyclops cruiser. Garibaldi and Lyta find one floating dead over a Vorlon colony world. I haven't seen anything in the Mongoose books or anywhere else on these ships. Were there any sketches for what it might look like, a la the Shadow hybrid Star Fury? "Whoever angers you, controls you." I haven't read The Nautilus Coil since - well, since it was first published in the B5 magazine. I'd have to dig my copy out, but would it be related to the class of Psi Corps ships that we glimpsed in hyperspace at the end of The Corps is Mother, The Corp is Father? Related to the motherships, I think, yes. I imagine it's a follow-up design, more of a military vessel, either for risky exploration missions (they already lost one ship on such a mission, along with its crew, in the short story 'Genius Loci' by JMS), or because Psi Corps knew they would go to war soon. The motherships seem to be logistical vessels to move the Corps' people around hyperspace without anyone observing. They travel off the hyperspace beacon routes, which is similar to how the Technomages travel, so they might come across a mothership now and then. They are also used to test new experimental systems, to see what kind of abilities telepaths can develop in hyperspace, where their talents are amplified. The 16 long pylons on the motherships (according to Mongoose) each contain a telepath. If they're all networked together, I would think they might be fitted with the Shadow tech wetweb gear we saw on Caroline the blip in 'Ship of Tears.' All of this leaves open the big question of just what new capabilities they have managed to develop? We saw Talia and the blips in 'A Race Through Dark Places' all hold hands and use their abilities together to trick Bester into thinking they were dead. We have not yet seen Psi Corps attempt such a feat, but it appears they have built specialized ships around this very idea. Perhaps they were built in case the Shadows decided to attack Earth. Many in the Corps leadership didn't trust the Shadows, and they might have wanted their own means to shut down their warships, and even their own former telepaths inside them. Oddly, in one of the short stories, Lyta and G'kar find a mothership floating dead in space, and in another, Lyta and Garibaldi find a Cyclops floating dead in space. In 'Nautilus Coil,' the Cyclops seems to be waiting in orbit for Kevin Vacit and his Psi Cops to make it off the colony and get it running again. There's even an old Vorlon jumpgate in the area, which would probably take them someplace interesting. There is some info in the Mongoose Psi Corps book on the seven motherships, but of course, not enough. Nothing on the Cyclops, anywhere, outside of 'The Nautilus Coil,' but we've all seen how JMS liked to introduce new ships gradually. That book also has some very cool descriptions of the Corps' black projects: telepath drugs, cyber implants, sleeper agents, the Ironheart experiment, and attempts to prolong the lives of powerful telepaths, or to keep them around and functioning in some fashion after they die. It really leaves the impression of a Frankenstein's lab mindset in Psi Corps' science division. Creepy stuff. "I drink a lot, and I collect snakes." Last edited by Raw Shark; May 18th 16 at 23:44. I'll need to check out those Mongoose books - I see them on eBay quite a bit (and it always lovely to look at pictures of the painted miniatures, I have a few of them myself for display). I presume they didn't actually make a miniature of the Cyclops warship for the game? And are the books considered 100% canon? I never got into the miniatures, although I bought a few from Agents of Gaming as they were collapsing. I doubt there is a Cyclops miniature. The later books, like the trilogies, are considered more canon than the earlier ones, but not 100%, otherwise JMS might have found himself painted into a corner by someone else's writing at some point. 'Nautilus Coil' was written by J. Gregory Keyes, who also wrote the Psi Corps novel trilogy, so I think it's also more canon than not. And it's clearly meant as a bit of set-up for whatever was going to be revealed in Crusade, and maybe a Telepath War film. The story takes place maybe a few months into the Telepath War, which has a timeline that's pretty tricky to work out. JMS was always pretty careful when introducing new ships to the B5 universe, and this one introduced both the Cyclops and the Toreador, a ship Garibaldi bought from IPX and fitted out with heavier weaponry, probably because he sees a Telepath War raging all around him. He and Lyta travel to Vorlon space in it, and then presumably return home to get shot at some more. Did Mongoose publish the novels in the US? I was referring more to their gaming books - I've never bothered with their gaming books as it looks like there's a lot of made up ships so I always assumed it was non-canon and just for the gaming side of things. I've read all the novels and short stories, including Keyes' Psi Corps trilogy. Some of the details though are a little misty in my head as it's been a while since I read them. Was The Nautilus Coil the story where Ivanova comes back with her new ship? Did Mongoose publish the novels in the US? Not...really. At one point they planned to and had arranged a license with Warner's but then...something happened. The short version is that they inadvertently offended JMS when they asked him to review the manuscripts-then they were going to base some of the novels on his unproduced Crusade scripts (with WB approval but not JMS'), then they claimed that their books were going to be 100% canon (thinking they only had to buy that right from WB), then JMS agreed to review the manuscripts after all and declared them unprofessional and 'licensed fan fiction'. After this very public kerfluffel, Mongoose decided not to publish novels after all. But some of them did become public from the authors sharing and from some publicity copies-including Claudia's. I've attempted to read three of them and my opinion matches JMS'. Claudia's *might* have been salvaged but the other two were completely unreadable. "Hidden Agendas" was the Ivanova story. Last edited by Jan; May 19th 16 at 13:35. I remember that now and feeling bad for the publisher that they'd been shamed so badly in public by JMS! But having just gone on Google and hunted down the synopses of the books, it sounds like a good thing they were never published. They were a bit obsessed with the Rangers, weren't they? The descriptions do sound terribly fan-ficky. Were they even worse than the likes of Touch of Your Shadow, Whisper of Your Name and Personal Agendas?